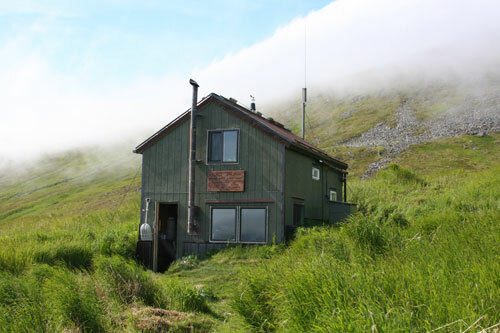 The Walrus Islands State Game Sanctuary (SGS) is a very remote, low impact camping experience. You should have complete camping gear and come prepared to be self sufficient as there are no accommodations available. The ADF&G does provide some limited support at the Round Island site, see Facilities below for a description of facilities available and What to Bring for a suggested list of gear to bring. Weather changes rapidly in Bristol Bay during the summer. The average wind speed on Round Island is about 10-20 mph, and winds often reach speeds in excess of 50 mph during summer storms. It rains about 25 percent of the time and thick fog is common. Temperatures usually range from 35°F to 70°F. You should pack your gear in waterproof containers for the trip to/from Round Island and during your stay and be prepared for bad weather. Bring outdoor apparel suitable for layering and cool wet fall weather. Good rain gear is essential as the area is subject to storms and wet weather. If rough weather sets in, it may be necessary to remain a few additional days until your transporter can pick you up. Make your plans with this possibility in mind. Once you get to Round Island your boat will anchor in Boat Cove, a small relatively unsheltered bay on the north side of the island. Boat Cove is located between several major walrus haul-out areas and it is frequently used by up to 300 walruses as a resting area and travel corridor. Consequently, it is important to minimize your time in the cove and be as quiet as possible while anchored there. Your boat taxi will ferry you and your gear to shore in a small open skiff. You will be stepping off the skiff onto a wet and slippery boulder-strewn beach so rubber knee-high boots are convenient. You should also consider packing your gear in waterproof bags. After unloading, you will carry your gear up a steep trail to the top of an 80-foot high bluff. This can be a difficult climb, so pack your gear in lightweight loads (less than 40 pounds) that you can carry up the trail. The camping area is a short distance from the top of the bluff. The sanctuary staff will inspect your permit, provide you specific instructions on the rules of the sanctuary and help you get settled in the campground. The Wildlife Comes First At Round Island. The Walrus Islands SGS was designated in 1960 to protect the last known terrestrial walrus haulout in Bristol Bay. All human use in the sanctuary is managed for the continued protection of this haulout, the walrus and other wildlife within the sanctuary. The goal of the permit program is to provide the public with an opportunity to view and photograph this wildlife while minimizing impacts to the walrus and other wildlife. You are required to sign a liability waiver at Round Island because there are inherent risks anytime one travels in remote country. Department personnel are trained to provide assistance to visitors with emergency needs. However, you are responsible for your own safety. The trails on the island can be slippery, rocky, precipitous and dangerous. Rain and wind can quickly make a trail or viewpoint unsafe to use. Always think safety first! And exercise your most conservative judgment while visiting Round Island. Remember that low visibility, fog rain and high winds may prevent emergency medical care for several days. Be careful, be safe and enjoy your visit to the Walrus Islands State Game Sanctuary. 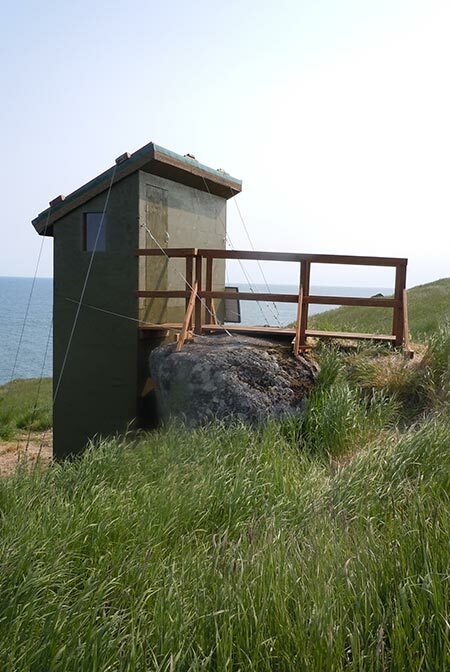 As noted above the Walrus Islands SGS is a very remote camping experience, however, some amenities are provided at the Round Island camp to support visitors and staff. The following is a brief summary of the facilities available at the Round Island Camp. Photos of these facilities can be viewed by clicking on the highlighted facility. The layout of the facilities in relation to each other and viewing areas can be seen through the site sketch (PDF 245 kB), aerial view of camp, and overview maps (PDF 290 kB) . 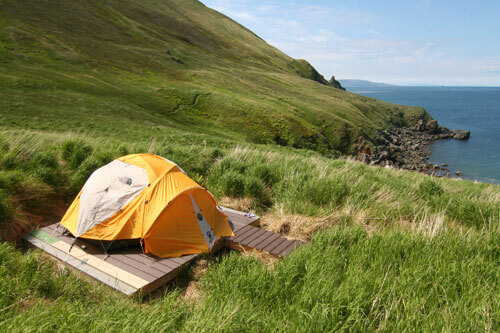 Campsites: The Round Island camping area overlooks Bristol Bay looking toward Kulukak Bay and the Nushagak Peninsula. Swimming walruses are often seen from the camping area and on calm nights you may hear walrus grunting, bellowing and strumming. There are 8 campsites, where tents are pitched on 10 ft. x 10 ft. or 10 ft. x 12 ft. tent platforms located in slight depressions surrounded by tall grass. These are clustered in the campground area near the Cook Tent. Cook Tent (PDF 143 kB): There is a 12’ x 24’ (3.7m x 7.3m) public use cook shelter at the Round Island campground. A three burner propane cook stove is provided in the campground cook shelter but you will need to bring all your cooking and eating utensils (pots, pans, plates, cups, bowls, forks, spoons, etc). All cooking is done in the cook shelter and food is stored in the hard-sided container at the cook shelter. You can bring your own hard-sided container (such as a cooler) to secure your food, but food items must be stored so that wildlife cannot access it. The red foxes inhabiting the island are curious and they have not yet learned to associate people with food, so they remain friendly but wild. Once they start getting food from people, either by stealing it or from handouts, they will start damaging tents and gear to obtain food. Please note that it is against Alaska state law to feed foxes or negligently leave food in a manner that attracts foxes. The small cook shelter has tables, benches, and a collection of natural history literature and also acts as a community gathering place to allow you to warm up and dry gear. It is provided for all island visitors, however, so you will not be allowed to sleep in there. Restroom facilities: A single outhouse with a composting toilet system is provided within the camp ground area for use by all campers. Wastes other than human excrement, such as paper products, are disposed of separately. Utilities: The only water available throughout the summer is untreated fresh water from a nearby stream / spring about 200 yards from the camping area. The water is not treated and boiling or using a water filter is highly recommended to avoid any water-borne diseases. Visitors will need to filter or treat their own drinking water and should bring water filters or other water treatment methods to purify drinking water. There is no electricity or power access for visitors to charge batteries, or run other electronic equipment. There are no cell phone or internet capabilities. Trail system (PDF 245 kB): You must stay on the established trail system and access to any of the islands beaches is prohibited. 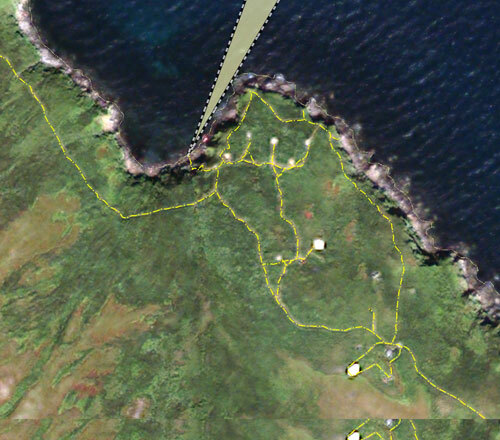 Most viewing areas on Round Island are within a 1 mile radius of camp along a single track trail system. While these near viewing area hikes are not particularly strenuous they can be hazardous in that they involve hiking across uneven terrain near cliff edges, often in slick conditions. The trails on the island can be slippery, rocky, and precipitous and dangerous. The furthest and most hazardous viewing point is located at West Main Beach along the Traverse Trail. This trail is extremely steep and is a strenuous hike. Rain and wind can quickly make this area unsafe to use. You must check in with staff and get permission for access prior to attempting this trail or prior to hiking to the summit of the island. Staff Facilities: A combination cabin / office exist on the site to provide staff with office space, living quarters and camp maintenance equipment during their 4 month stay on the island. The cabin also acts as a point of contact for staff in the case of emergency. Round Island is far from medical facilities and it is a potentially dangerous place. Our staff have limited medical supplies for emergencies are trained in first aid and in responding to emergencies but they are not trained medical personnel. Staff are equipped with emergency communications including VHF and Marine band radios, and satellite telephones to communicate emergency response needs with the USCG, local hospitals and emergency response agencies. 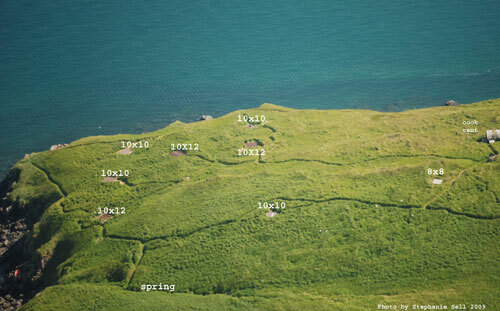 There is a hospital in Dillingham which is equipped to respond to most medical emergencies; however, weather may prevent aircraft or helicopters from reaching the island for days at a time. Therefore, it is important that you be cautious while visiting the island. Satellite telephone use is limited to State business and visitor emergency response. If you believe that you will need communications off island you will need to arrange to bring your own satellite telephone. You should bring personal physician and emergency contact information with you in case there is a need for staff to contact them in an emergency.